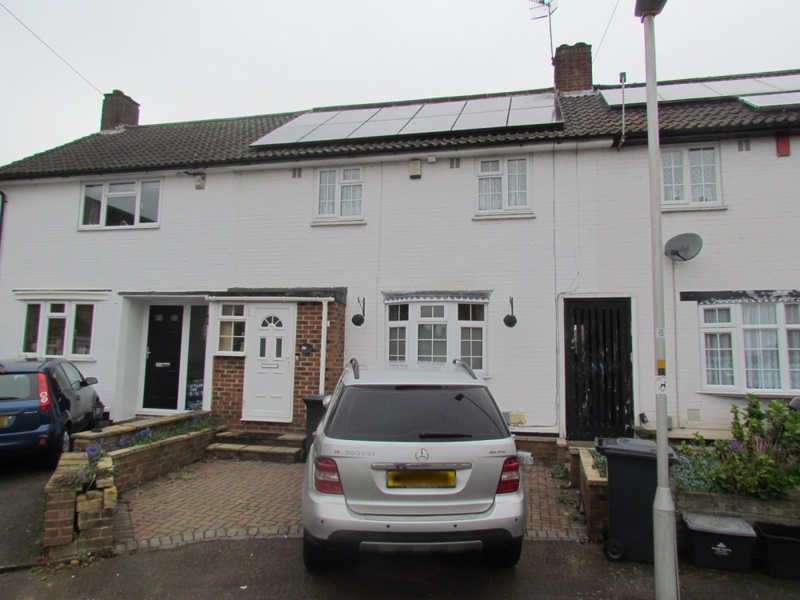 We are pleased to offer this well present 4 GOOD SIZE BEDROOM FAMILY HOME, located in a central location close to local town shops and the Brookfield Farm Shopping Centre. The property features lounge, spacious kitchen dining area and en-suite shower room to master bedroom and further benefits from re-fitted family bathroom, solar power panels, gas central heating, UPVC double glazing, approx 40ft West facing rear garden and off street parking to front. LOUNGE AREA: 16'9 x 10'3 Double glazed bow window to front, feature fireplace, TV point, 2 radiators, stairs leading to first floor landing with understairs storage cupboard, coved ceiling, dado rail, opening into:-. KITCHEN/DINER: 17'0 x 12'3 Double glazed window to rear, a good range of fitted wall and base units with matching glass display cabinets and under pelmit lighting, work top surfaces incorporating single drainer sink unit with mixer taps, integrated gas hob with extractor hood over, built-in double oven under, plumbing for washing machine and dishwasher, inset ceiling spot lights, radiator, laminated wood effect flooring, French doors to rear garden. BEDROOM 2: 9'6 x 8'7 Double glazed window to rear, radiator, mirror fronted walkin wardrobe with shelving and hanging space. BEDROOM 3: 8'8 x 8'6 Double glazed window to front, radiator. BEDROOM 4: 10'9 into recess x 7'7 Double glazed window to front, radiator. RE-FITTED FAMILY BATHROOM: Double glazed window to rear, 3 piece suite comprising of panel bath with mixer taps and independent power shower and screen, vanity wash hand basin with cupboard under, low level wc suite, radiator, laminate flooring, exposed walls fully tiled, inset ceiling spot lights. BEDROOM 1: 12'0 upto fitted wardrobes x 9'0 Double glazed windows to rear, a good range of fitted wardrobes with matching dressing table and bed side cabinet, radiator, inset ceiling spot lights, further 9'3 x 4'6 area currently used as office space but ideal dressing area/sitting area. EN-SUITE SHOWER ROOM: Double glazed window to rear, 3 piece suite comprising of corner shower cubicle with electric shower, low level wc suite, vanity wash hand basin with cupboard under, radiator, tiled flooring and exposed walls fully tiled, inset ceiling spot lights. GARDEN: Approx 40ft. West Facing with large covered sitting area, area of artificial lawn bordered by raised flower beds and fully fenced, outside power and lighting, wooden storage shed and further brick shed, outside water tap, shared side pedestrian tunnel access. PARKING: Off street parking to front of house.